The PGPM Programme at IBS, Ahmedabad prepares students to take up higher responsibility at the early stage of careers. Since 1995 it has been our endeavor to offer management programme relevat to industry requirements. The presence of IBS alumnus across the industries communicates the high acceptance of the PGPM programme by the industry. At IBS, Ahmedabad the applied learning and practical application will transform you into the leader to take up challenges of the corporate world. The two years at the campus would be a unique learning experience, the innovative program design and interactive academic delivery by experienced faculty will enable to expand horizons. The case method of teaching, Summer Internship and industry based electives will equip you with managerial skills to be employable in changing business scenario. On this note, I welcome you to join the journey of transformation towards excellence. Bonoboz Marketing Services Pvt Ltd.
IBS-Ahmedabad has come a long way in building a very strong brand amongst the corporate houses since its inception in 1995. Learning halls well equipped with high speed LAN, Wi-Fi, and other facilities. Computer lab with modern computing facilities. A web portal for faculty student interaction and development. A library with more than 21,000 books, 71 magazines and journals, and 600 CDs on topics relating to management and allied subjects, and access to various databases. A team of full-time faculty members, with rich experience in management education and industry, who are engaged in research besides teaching. Active research which has resulted in several books, cases and research papers. Mount Abu Leadership Camp: IBS Ahmedabad has institutionalized a unique leadership and team building exercise for every incoming batch known as Mount Abu Leadership Camp. During this camp adventure activities like rock climbing, rappelling, jungle trek, night walk will be organized besides management games which focuses on leadership and team issues. Dr. Ranga is a gold medalist in Physics and post graduate in Management. He completed Phd in Advertising Effectiveness and FDPM from IIM-Ahmedabad. He is associated with IBS for 15 years has been teaching subjects like Marketing Communications, Retail Management, Consumer Behaviour and B2B Marketing. His research interests are in advertising and consumer behavior where he has participated in national and international conferences. His current research is to study the impact of digital media on recruitment and consumer engagement. He is trained Faculty on the “Case Method” by IBS and Harvard Business School, Cases written by him are uploaded on European Case Clearing House. He is also Certified trainer by HDFC Bank for training on banking operations. He has conducted workshops on Pedagogy for faculties of engineering and management colleges in India and Case Workshop in Oman. He is a Visiting Faculty at NID-Ahmedabad for its graduate and post graduate courses. He is also a “Visitign Professor” at University of Paderborn Germany for a course on “Marketing in Emerging Economies” and also regularly invited in the FDP Prorgamme of IIM-Ahmedabad. He is the Member of Curriculum Review of Marketing subjects for the IBS PG Programme and the editor of ICFAI Journal of Entrepreneuship. He is registered Doctoral Guide and three students are undertaking doctoral research. As a faculty member he has guided numbers students on internships and actively mentored and mentored alumni for their and contributed actively to the institutional building activities. He was awarded as “Best Teacher for Institutional Building” by IBS. He has Co-ordinated and also served as a Chairperson of the Placement Committee, and has been instrumental in creating industry partnerships and generated domestic and international placements for more than 2000 students. He has extensively networked with industry and regularly invited for Panel discussions and as “Guest Speaker” at various industry forums. He has also conducted series of Workshops for the “Training & Placement Officers” of engineering and management institutes in managing placements. He has also served also as a Co-ordinator of Alumni Relations and has maintained a constant touch with alumnus in guiding them on their career endeavors. Dr. Ranga is on the board of Confederation of Indian Industries on Panel of Higher Education and Secretary for Gujarat Chapter of AIMS (Association of Indian Management School. Before joining academics, he has worked with industry in Sales & Marketing. As Campus Head of IBS-Ahmedabad, Dr.Ranga has taken up new initiatives and is actively working with students and the faculty members. Vivek is an alumnus from the Class of 1998 of IBS Ahmedabad. He completed Bachelor Degree in Production Engineering in year 1994, before pursuing management education from IBS, in the year 1998 he became a Chartered Financial analyst (CFA). He has earlier worked with Tata Elxsi Ltd. as a Sr. Product Manager and Real Image Media Technologies Pvt. Ltd. He is currently working as a General Manager with Reliance Entertainment. Peyush is an alumnus from the Class of 1998 of IBS Ahmedabad. He completed Bachelor Degree in commerce before coming to IBS campus. He is currently working as DGM – Finance & Treasury with CLP Power India. He was earlier with Gujarat Powergen Energy Corporation. Prasad is an alumnus from the Class of 2000 of IBS Ahmedabad. 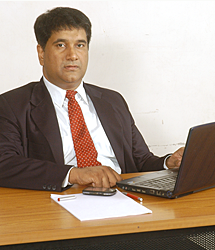 He completed his Bachelor Degree in Science in the year 1997 and then went on to pursue his PGDBA from IBS. He is presently in the UNITED STATES OF AMERICA working for Tekstrom Inc as a General Manager – US Operations & is based at Newark.